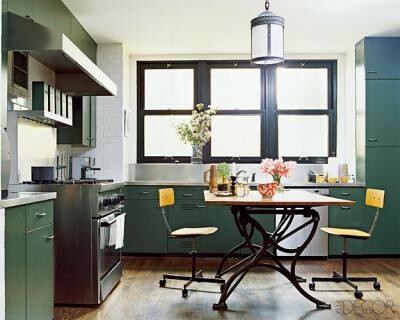 Nate Berkus's vintage kitchen, featured in Elle Decor, upload feito originalmente por xJavierx. The kitchen of Nate Berkus's Chicago apartment. The 19th-century architect’s drafting table is from Pavilion Antiques in Chicago (pavilionantiques.com). The school chairs are from the 1950s. Range is by Viking and metal cabinets are original. Subway tile by Ann Sacks (annsacks.com). Photo by Pieter Estersohn, Elle Décor, March 2009. This seems to be a great site which offers Flooring service, Flooring Product, Flooring Design, Flooring Experts etc. and i would surely like to try their service...i had been relying on http://commercialflooringsystems.com earlier and they too offered good stuff.